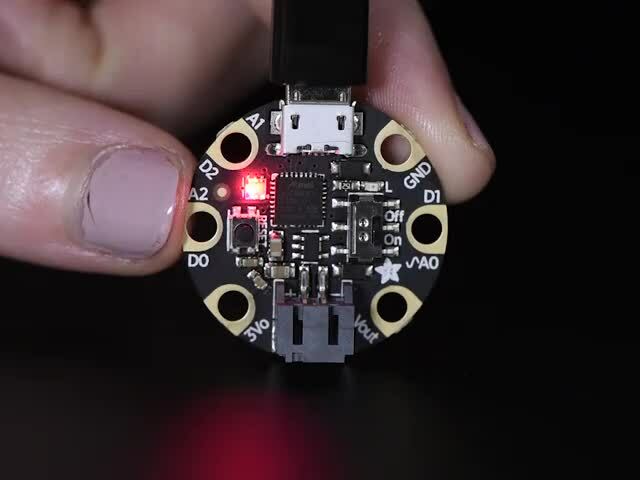 You will need to cut and strip 6 strands of 30 guage wrapping wire for connecting the button and 8x8 LED matrix to GEMMA. Measure the length of the strips to about 90mm. You can optionally add labels to each wire with a piece of masking tape. If your new to working with GEMMA, check out the intro guide. Solder all 16 pins. Apply the soldering iron to the pin and hold it there for a few seconds. 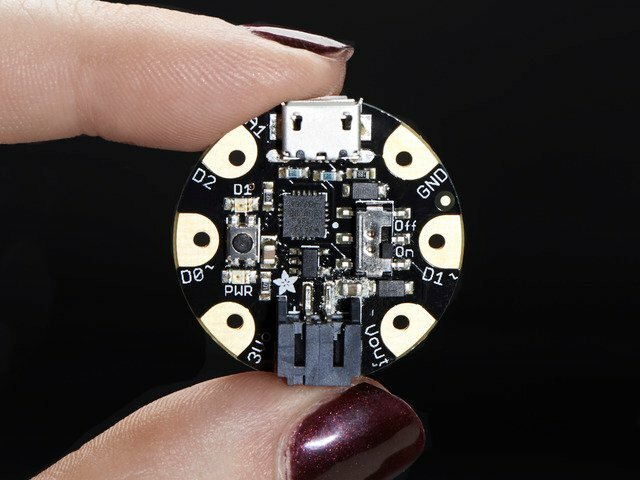 Add small amount of solder to heated pin, not the tip of the iron! Clip and trim the pins when you're finished soldering. 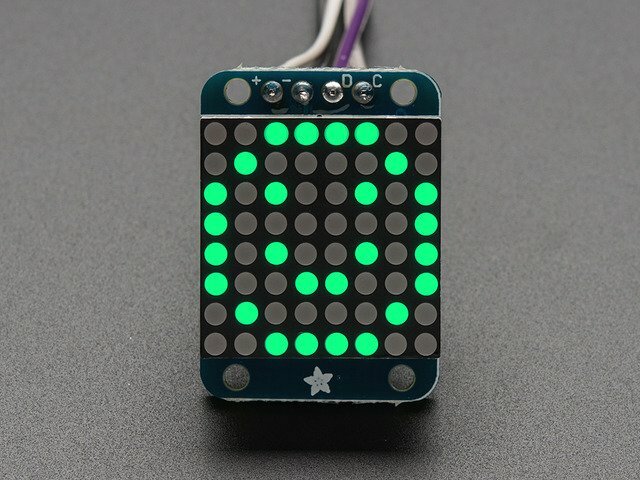 Apply a small amount of solder to tin the 4 pins on the top of the 8x8 LED matrix backpack. Try to heat the back of the pin, and then applying the solder to the front of the pin. Solder 4 strips of 30 gauge wrapping wire to the 4 pins on the backpack. Try heating the back and pushing the wire through once it's liquidy. Use a third helping hand to hold your components in place while you solder. Tin the 6 pins on the GEMMA. Solder the 4 wires from the LED Matrix to the pins of the GEMMA. Below is a mini reference list for each pin. And here's the GEMMA + 8x8 LED matrix circuit! 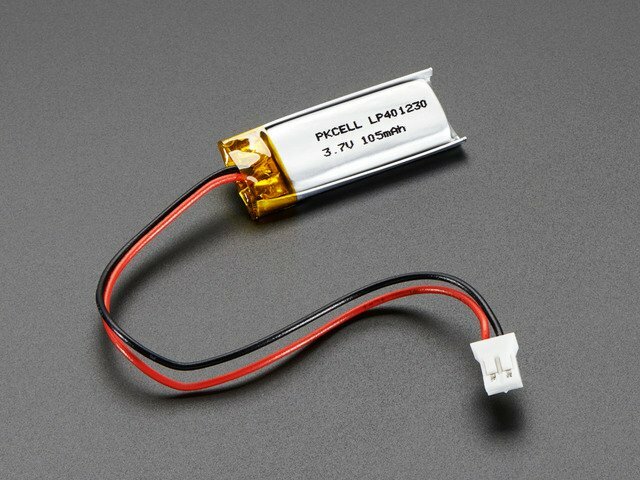 At this point, you can plug in a lipo battery to the JST to power it on and test if it works. The mini 8x8 LED Matrix should have enough slack to move freely from the GEMMA. 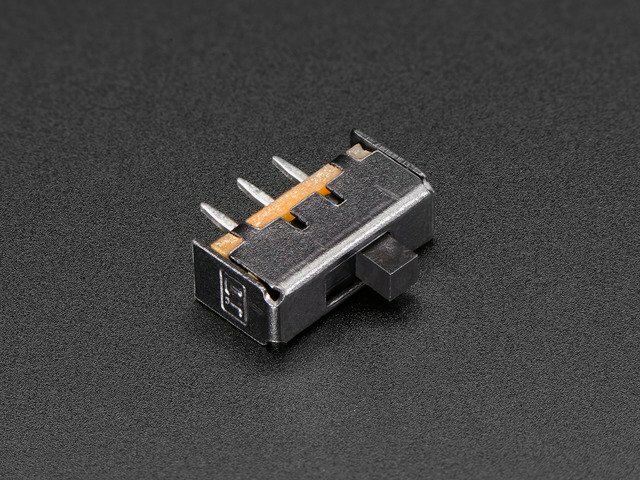 For conveniently powering our circuit, we recommend creating a switch/JST adapter. Using a JST extension cable, we can splice it onto a slide switch. The male end of the JST connects to the GEMMA, while the female port connects to your rechargeable battery. Tin the middle and any outside pin of the slide switch with a small amount of solder. Be sure to apply rosin to each pin in order for the solder to stick properly. Use heat shrink tubing to secure our soldered connections. Snip off the extra pin in the switch. It could cause a short in our circuit once it's mounted in the box enclosure. Use a third helping hand to assist you. Use each arm to hold onto the JST ports. Use diagonal tweezers to hold the stripped wire with one hand while using your other hand to hold the soldering iron. 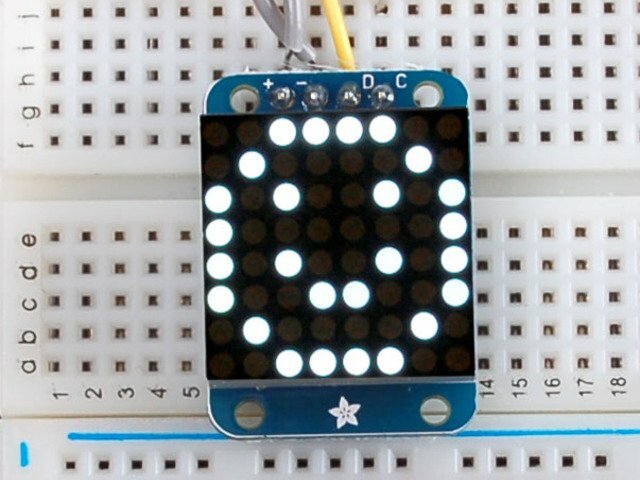 Use a tactile push button for replaying the LED animations. Snip off any two diagonal pins and tin them. Before soldering, be sure to add a piece of heat shrink tubing for securing the connection after you solder. Solder one piece of wrapping wire to each pin. With the wires securely soldered, put the heat shrink tubing over the connects and heat it up to seal the connections. Once the button is wired up, solder the two wires to the GEMMA. Order of pins doesn't matter as long as one goes to 3V and the other to D1. The next page shows you how to put these electro guts into BMO's boxy box. This guide was first published on Feb 20, 2014. It was last updated on Feb 20, 2014. This page (Assembling Circuit ) was last updated on Apr 14, 2019.